I thought Elijah was the heaviest because all babies born the same day as he, weighed less than three kilos until the world was stunned 3 weeks after Elijah was born by this Indonesia’s heaviest newborn. Baby boy Muhammad Akbar Risuddin who tips the scales at 19.2 pounds (8.7 kgs) was delivered through caesarean section at a medical facility in North Sumatra province. 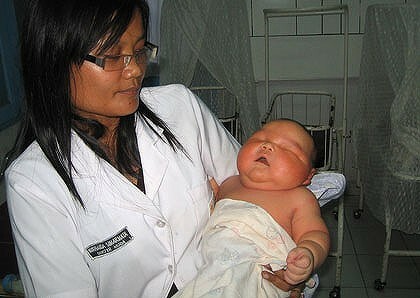 The baby was named after the local district chief and “Akbar” means big. His mother, 41 years old was diabetic.